The International Association of Registered Financial Consultants (IARFC) announces the recipients of their 2018 Member Awards. 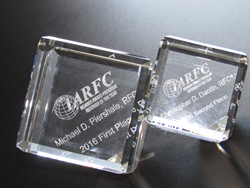 Presented annually, this recognition is in appreciation of top IARFC members who have recruited the most new qualified professional consultants who joined the ranks of the Association. These members are influential in promoting the IARFC and its mission to other financial professionals. Their support is extremely important to my 2019 goal of increasing Association membership... IARFC Chairman and CEO H. Stephen Bailey, MRFC. Third Place – Christopher J. Dixon, RFC®, Gavin Merwin, RFC®, Brandon Setlock, RFC®. The IARFC is a professional association where its designated and credentialed members meet stringent requirements in the area of experience, education, examination, licensing, conduct, ethics and continuing education. True to the IARFC mission, these Member Award recipients enhance the influence of the Association for the benefit of the members and the clients they serve. The Association as an entity strengthens the financial services profession through adherence to and promotion of ethical behavior and a focus on continuing education. Be on hand to acknowledge these individuals as they receive their awards during the Awards Banquet on Thursday evening at the IARFC Annual Conference in Nashville, TN March 20-22. Those who wish to attend the conference can register now and experience the complete roster of presenters, topics and exhibitors. The Gaylord Opryland Resort and Convention Center is a fun and lively venue – convenient to shopping and sightseeing in the heart of the Country Music Capitol. For more information about joining IARFC or attending the 2019 Annual Conference, visit http://www.iarfc.org.